Jostens manufactured watch. The face of the watch reads “91 92 93 96 WORLD CHAMPIONS” with a Bulls team logo above and the top, bottom, left and right all feature a Larry O’Brien Trophy. Engraved in the middle of the back of the face reads the name “WALLY McLAIN”. 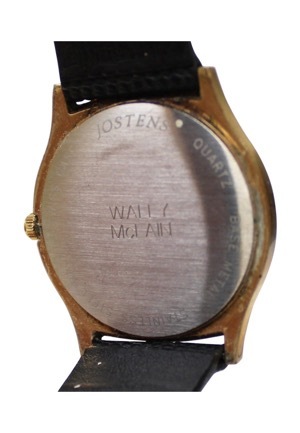 On the edges of the back of the face reads “JOSTENS”, “QUARTZ”, “BASE METAL”, “STAINLESS STEEL BACK” and “SWISS CASE”. The watch needs servicing to return to working order. 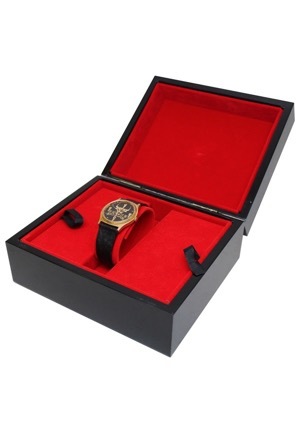 Also included is the 7x6x4” presentation box. 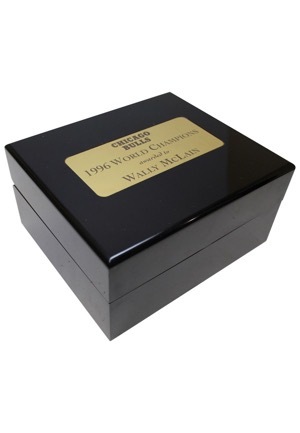 Engraved on the top is “CHICAGO BULLS 1996 WORLD CHAMPIONS awarded to WALLY McLAIN” on a gold plate. The box presents well when closed but when opened the top half can fall off.